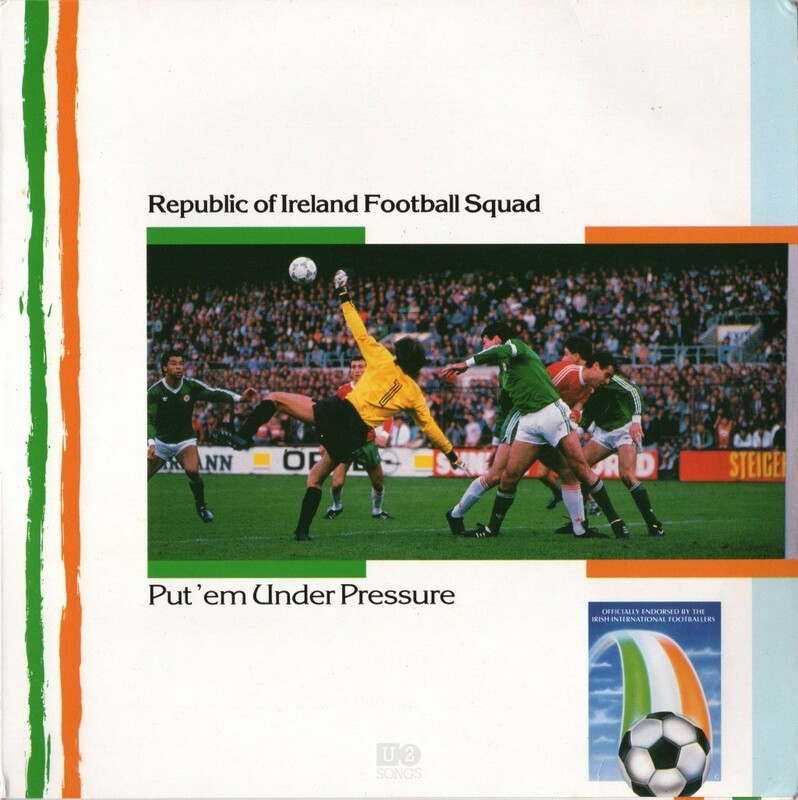 “Put ‘em Under Pressure” was the official song of the Irish national football teams 1990 FIFA world cup campaign in Italy. Soccer fan, Larry Mullen, is an avid follower of the Republic of Ireland’s national team, and in 1990 he helped produce the record for the squad, and was also given writing credits on the song. The team had just qualified for the World Cup in Italy. It is Maire Brennan of Clannad providing the haunting vocals at the start of the song. The song itself borrows heavily from the Horslips song “Dearg Doom”, borrowing the guitar riff for the basis of “Put ‘em Under Pressure”. The Horslips song had borrowed itself from an old Irish fight song, entitled “O’Neill’s March” or “O’Neill’s Calvary March” taking the guitar part from the melody of that song. The song also makes use of the “Ole Ole Ole” chant famous amongst soccer fans, as well as the “we’ll really shake them up” lyrics from Scotland’s 1978 song, “Ally’s Tartan Army”. The references to Jack, are references to the manager of the Irish team, Jack Charlton, who started with the Irish team in 1986. Vocals snippets from Charlton were also included into the mix sampled from TV interviews. It has been rumored that having difficulties with the football team getting the lyrics nailed down, Mullen brought in a group of fans gathered outside of Windmill Lane to help flesh out the chorus, and they are mentioned on the sleeve as the “Windmill Carpark Choir”. The song was released in 1990 under the Son label, which was part of U2’s own label, Mother Records. It entered the Irish charts on May 31, 1990 at number one, and held the number one position in the Irish charts for 13 weeks. It became the longest running ever in the Irish charts on August 12, 1990, a record it held until the release of the Riverdance single. Ireland were defeated 1-0 by Italy in the quarter final of the 1990 FIFA world cup. A video was filmed, mostly of the football players being recorded in studio, although there is a brief shot of Larry in the recording booth. The song was released in both Ireland and the UK. The Irish release on 7” features paper labels, while the UK release features a moulded label. There was also a release on 12”, Cassette, and CD in Ireland. The 7” was backed with the song “Pacemaker”, the cassette featured “Pacemaker”, “Molly Malone” and “The Boys in Green”. The 12”-vinyl and CD featured “Pacemaker”, “Heartbeat” and a remix of “Put ‘em Under Pressure”. Larry Mullen was only involved in “Put ‘em Under Pressure” and the remix of the song. The song would later appear on multiple compilations “When Irish Eyes are Smiling” in 2002, “Here Come the Good Times: The Soundtrack to Irish Soccer” in 2002, and “On the One Road: Irish Football Anthems and Songs” in 2009. Produced by: Mullen, Woods / Donnelly. Engineered by John Grimes. Recorded at Windmill Lane Studios. Mixed at Outside Studio. Players: Maire Brennan, Davy Spillane, Tony Drennan, Helen O’Hara. In the Studio: Denis, John, John, Colin, Stuart Day. For the Video: Peter Brady, Ned O’Hanlon, Billy Magra, Isobel Stephenson, Anne-Louise Kelly. For the Squad: Fintan Drury, Billy Murphy. On the Terrace: Donal, Derek, Mark and the Windmill Carpark Choir, Paul Brady, Horselips. Lyrics courtesy of many thousands of Irish football supporters. To Bono, Paul McGuinness and God – Special Thanks.